"Rin" redirects here. For the smasher of the same name, see Smasher:RIN. Official artwork of Lyn from Fire Emblem Warriors. 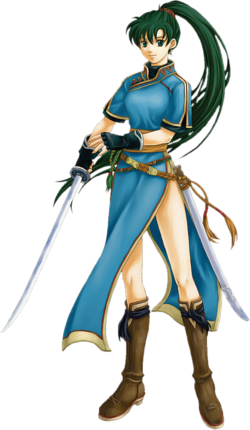 Lyn (リン, Lin), whose full name is Lyndis, is a character from the Fire Emblem series, specifically Fire Emblem: The Blazing Blade. She appears as an Assist Trophy, a trophy, and a sticker in Super Smash Bros. Brawl, and as an Assist Trophy and a trophy in Super Smash Bros. 4. Lyn is the second female main character in the series and the first one since Fire Emblem Gaiden; she is the only one of three main lords of the game who does not appear in Fire Emblem: The Binding Blade. Born in the Sacaen Plains, her parents—Lord Hassar, chieftain of the Lorca tribe, and Madelyn, daughter of Lord Hausen of Caelin—were killed by bandits before the beginning of the game. At the start of the game, Lyn meets the player (who acts as a tactician in the game); after assisting her in defeating bandits near her house, Lyn decides to follow him or her in the interest of training her sword skills. Along the way, she meets with many different characters, some of whom join her on her way; additionally, she later learns of her true fate of being the sole heir of the Caelin throne, and vows to defeat Lord Hausen's brother of Lundgren, who plans on taking the throne for himself. Lyn's eleven chapters primarily serve as a tutorial to new players, and her mode also had the unique feature in that it was the first time in the Fire Emblem series where characters can lose all their HP, but still be playable later in the game. Lyn later returns for both Eliwood's and Hector's stories; initially driven out of Castle Caelin by the Laus Army, she is assisted by Eliwood and Hector to reclaim the castle, and she later continues to travel with them, with plans to destroy the Black Fang and their leader's, Nergal, plans to bring dragons back to life. In both Smash Bros. games, her attack as an Assist Trophy is a mix of her critical attack and her normal attack as a Lord before she is promoted in Fire Emblem. Unlike the playable Fire Emblem characters who fight with their legendary weapons (with the exception of Robin), Lyn wields the Mani Katti, not her more powerful quasi-legendary weapon, the Sol Katti. However, the Mani Katti is the partner blade of Sol Katti, both of which are unique to Lyn. 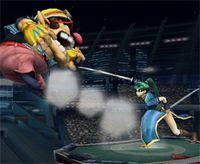 Lyn slashes Wario in Brawl. In Brawl, Lyn appears as an Assist Trophy. Upon being summoned, she charges her sword and causes the screen to fade to dark slightly, before teleporting near an enemy to deliver a slash. She usually hits the opponent closest to her. Her attack is powerful (KOing opponents as low as 32%) and pinpoint accurate, even against a moving or airborne foe as well as being capable of hitting Sonic out of his Final Smash. It can also hit an enemy that is edge grabbing. However, her attack can be avoided with a well-timed air dodge or roll, and Lyn will pseudo-self destruct without attacking if she happens to be summoned over terrain that will disappear before she lands. If Lyn lands in the spot she was summoned, but lands again in a different spot (like from a breakable block of Mushroomy Kingdom), she will automatically strike her closest target. An 18-year-old nomadic girl. Lyn is a strong-willed youth whose skill with the blade draws many admirers. Lyn sets out on her quest to become a master swordsman after coming to the aid of a fallen traveler. She soon learns she's a living member of the nobility of Lycia, a neighboring country. Soon she's involved in a violent dispute over the ascension of the Caelin throne. Lyn as she appears in Super Smash Bros. for Wii U.
Lyn reprises her role as an Assist Trophy, functioning identically to her appearance in Brawl; however, she can be defeated if she takes enough hits. While she still performs the same slash, it now appears as a crescent-shaped slice instead of a straight line across the screen. Lyn's trophy appears in both versions. In Super Smash Bros. for Wii U it is part of the Heroes of the Emblem Trophy Box. Trophy in Super Smash Bros. for Nintendo 3DS. Trophy in Super Smash Bros. for Wii U. Her real name is Lyndis, and she's the last survivor of one of the Sacaen tribes. She's strong and friendly, and her swordsmanship is epic. If you summon her in this game, she'll charge herself up before laying a critical hit on her nearest opponent. Expect a solid strike from her to leave a mark! Her real name is Lyndis, and she's the last survivor of one of the Sacaen tribes. She's strong and friendly, and her swordsmanship is epic. Summon her in this game and she'll charge herself up before laying a critical hit on your nearest opponent. Expect a solid strike from her to leave a mark! Lyn posing with Marth in Ultimate. Lyn returns as an Assist Trophy. Her model has been updated with more realistic proportions, including smaller eyes. She can be defeated, just like her appearance in Smash 4. Training Mode describes her Assist Trophy: Prepares and then executes a devastating slash. If she's struck, she'll counterattack. Official artwork of Lyn in Brawl. Artwork of all playable Fire Emblem characters and Assist Trophies, as posted on the official Japanese Fire Emblem Heroes Twitter account. Interestingly, Lyn is one of only three Assist Trophies in the Brawl, alongside Dr. Wright and Mr. Resetti, whose actual trophy is different from her artwork on the Smash Bros. DOJO!!. Lyn's NTSC trophy description in Brawl contradicts the English in-game text from Fire Emblem; the trophy describes her as being 15 years of age while the game states her age to be 18. This error is due to different translation teams; in the Japanese version of Fire Emblem, her age was in fact 15. This error was later fixed in the PAL versions of Brawl. There is a glitch on Shadow Moses Island that causes Lyn to become stuck when summoned should someone summon her while a pillar is being repaired below them. Lyn is the only Fire Emblem Assist Trophy not to originate from an installment that is represented by a playable fighter. However, her installment is a prequel to Fire Emblem: The Binding Blade, Roy's game of origin. This page was last edited on March 21, 2019, at 15:01.